Stephen Hopkins may be the son of John Hopkins of Winchester. Some sources state that he may also be the son of Stephen Hopkins who was baptized 29 OCT 1581 at Wortley, Wotton Underedge, Gloucestershire, England, but attention has now turned to John Hopkins. 1 New England Historical and Genealogical Register, (New England Historic and Genealogical Society), 2009, Vol. 163, p. 260. 2 Anderson, Robert Charles, The Great Migration Begins: Immigrants to New England 1620-1633, Vol. 1, A-F , Boston: New England Historic Genealogical Society (1995), 470. 3 Anderson, Robert Charles, The Great Migration Begins: Immigrants to New England 1620-1633, Vol. 2, G-O , Boston: New England Historic Genealogical Society (1995), 986-989. 4 Anderson, Robert Charles, The Great Migration Begins: Immigrants to New England 1620-1633, Vol. 3, P-W , Boston: New England Historic Genealogical Society (1995), 1703. 5 Austin, John D., Mayflower Families Through Five Generations: Vol. 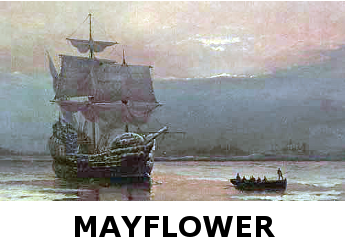 6, 3rd ed., Stephen Hopkins, General Society of Mayflower Descendants (2001), 5-6. 6 Ferris, Mary Walton, Dawes-Gates Ancestral Lines: A Memorial Volume Containing the American Ancestry of Rufus R. Dawes, Milwaukee, Wisconsin: Wisconsin Cuneo Press (1931), Vol. 2, p. 442, Ancestry.com (Online Database). 7 Ferris, Mary Walton, Dawes-Gates Ancestral Lines: A Memorial Volume Containing the American Ancestry of Rufus R. Dawes, Milwaukee, Wisconsin: Wisconsin Cuneo Press (1931), Vol. 2, p. 369, Ancestry.com (Online Database). 8 Pope, Charles Henry, ed., Paine Ancestry: The Family of Robert Treat Paine, Signer of the Declaration of Independence, Including Maternal Lines, Boston: Printed for the Family (1912), 7. 9 Roberts, Gary Boyd, "#74 Royal Descents, Notable Kin, and Printed Sources: The New England Ancestry of Actor Richard [Tiffany] Gere", (accessed 10/10/2014), New England Historic Genealogical Society (Online Database). 10 Roberts, Gary Boyd, Notable Kin, Volume 1 , Santa Clarita, California: Carl Boyer, 3rd (1998), 140. 11 Roberts, Gary Boyd, Notable Kin, Volume 2 , Santa Clarita, California: Carl Boyer, 3rd (1999), 28, 179. 12 Roser, Susan E., Mayflower Increasings, 2nd Edition , Baltimore, Maryland: Genealogical Publishing Company (1997), 62.